Thailand is simply teeming with wildlife. 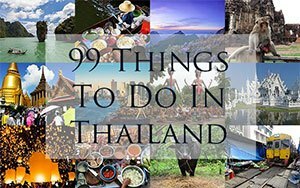 From the most delicate species of butterfly all the way to the Crab-Eating Mongoose, there’s not much that you won’t find hidden in the rolling landscape of the Thai Kingdom. Firstly, avoid the commercial wildlife operations that are commonly advertised to tourists: many are known for their cruel and inhumane treatment of animals. Activists have long condemned elephant trekking, for instance, as in order to be so domesticated that they allow humans on their back, the animal must have their spirits totally crushed beforehand. It’s not just elephants – the controversial Tiger Temple in Kanchanaburi was recently the subject of a National Geographic investigation, accused of breeding tigers for illegal trade. But there’s no need to patronise these sketchy organisations – permits are readily available to explore many of the country’s brilliant national parks and wildlife sanctuaries instead. Thailand is home to 127 national parks alone, many of which offer guided tours to help you get the most out of your experience and to ensure the safety of the animals within. If you’d prefer to go it solo, feel free to research on self-guided exploration. The elegant and agile Clouded Leopards are on the ‘must-see’ list for any keen wildlife spotters in Thailand, and Khao Sok National Park is the place to see them. They’re given away by the cloudy markings on their beautiful ochre to silver pelts, and their incredibly long canines – the longest of any living cat with some experts suspecting some shared ancestry with the Sabre Tooth Tiger. Clouded Leopards are classified as a vulnerable species and breeding programmes are in place throughout Thailand. Deep in Southern Thailand, Khao Sok is the perfect alternative to the nearby party destinations of Phuket, Krabi and Koh Samui and is home to some of the most beautiful landscape Thailand has seen. It’s covered by the world’s oldest evergreen rainforest, as well as limestone mountains, valleys, lakes, caves and more. There are around 200 huge Asian elephants within Khao Yai National Park, and they’re often spotted rustling for food in the undergrowth or even just walking down the middle of the road. While catching sight of such a majestic creature is sure to be a truly exciting feat, remember to stay on your guard and as quiet as possible in order to avoid incurring their wrath. They may be particularly volatile if they are accompanied by baby elephants. Khao Yai is Thailand’s oldest national park and is also a UNESCO World Heritage Site. Guides are available while staff at the visitor centre speak English and are very helpful. Elephants aren’t the only draw of Khao Yai; tigers, bears, snakes or perhaps some of the park’s 382 species of bird. Described by Rudyard Kipling as “the most bizarre of the ursine species,” the Asian Black Bear is a vulnerable species with a declining population, but has been occasionally spotted within Kaeng Krachan National Park in Phetchaburi and Prachuap Khiri Khan Provinces. Although only medium sized, the black bear is known to be aggressive towards humans so care must be taken if you are lucky enough to spot one. Kaeng Krachan is Thailand’s largest national park and is generally regarded as the best the Kingdom has to offer in terms of bird and butterfly watching. It covers a diverse topography, including rainforest, mountains and two rivers, and boasts a bewitching, heavy mist every morning. As the home to Thailand’s largest tiger population, Huai Kha Khaeng is an absolute must-visit for fans of the beautiful big cat. While there are thought to be around 90 Indochinese tigers within the sanctuary, spotting one is still relatively rare and seems to come down to luck and good eyesight. Huai Kha Khaeng is a UNESCO World Heritage Site and thought to be home to one third of Southeast Asia’s mammals, including deer, boar, macaque, elephants, bantengs, leopards and 355 bird species. While a small section is open to visitors, you will need to apply for a permit if you wish to visit more prohibited areas. The Agile Gibbon is usually found on Borneo and Sumatra, but there is also a thriving population of the primates down near the Malaysian border at the Hala Bala Wildlife Reserve. Their long arms do justice to their ‘agile’ name and the pace at which they move is nothing short of mesmerising. The Agile Gibbon is sadly endangered thanks to habitat destruction and the pet trade. Hala Bala used to be nothing more than a warring rebel stronghold thanks to the strategic landscape of the area – high mountains and thick forest – although it has been an official sanctuary since 1996. It covers the Sankala Khiri mountain range, as well as the forests of Hala and Bala, and is home to 350 bird species and a number of mammals, including the Tapir, Malaysian Sun Bear, Leopard, Asian Elephant, and more. You will need to request a permit in advance before hiking through the reserve. Khao Sam Roi Yot is Thailand’s first marine national park, located just 3 hours south of Bangkok. Dolphins, including the Irrawaddy species, can often be seen splashing around the coastline and out at sea so be sure to try out a boat trip during your visit. The Irrawaddy is instantly recognisable from other varieties of dolphin due to it’s peculiarly short beak and front-facing blow hole. It’s genetically very closely associated to orca (killer whale) although its appearance is more akin to the beluga. Khao Sam Roi Yot (translated as “the mountain with three hundred peaks) is so called due to its mountainous limestone landscape. It covers one of the largest wetlands in Thailand and hides a series of caves, including the famous Phraya Nakhon, coves and islands within its boundaries. There’s no mammalian beasts like elephants and tigers, but birds and monkeys are in abundance. Look out for the Serow antelope! If you’re incredibly lucky, you may just get to see the rare, critically endangered, 2-horn Sumatran Rhinoceros if you pay a visit to the Phu Khieo Wildlife Sanctuary in Chaiyaphum province – footprints of the beast were last tracked there in 1996, although sadly there has been no sighting since. The smallest rhino species in existence, Sumatrans are also known as ‘hairy rhinoceroses’ thanks to their long hair. There are thought to be less than 100 in the wild today. While it’s unlikely you’ll spot one, it’s still worth paying a visit to Phu Khieo if you’re passionate about wildlife. It’s home to over 350 species of birds and is one of the world’s most important sites for the conservation of the endangered white-winged duck ‘cairina scutulata’. There’s also tigers, elephants, leopards, dhole and more to be found there. Where’s your favourite site to spot wild animals in Thailand?